When you click the My Dashboard link in the website menu bar, you go directly to your Administration panel, starting at the Dashboard page. Several modules provide you with information about your blog, as well as actions you can take to navigate to other areas of the Administration panel. Hover your mouse over the title bar of the module you want to move, click and drag it to the spot you want to display it, and then release your mouse button to drop it. Expand (open) and collapse (close) the individual modules by clicking your mouse anywhere within the grey title bar of the module. You can click any of those numbers to access the appropriate Edit page. Directly to the right of the Recent Comments section in the Dashboard is the Incoming Links section, which lists all the blog-savvy people who wrote blog posts that link to your blog. The last module of the Dashboard page is Stats. 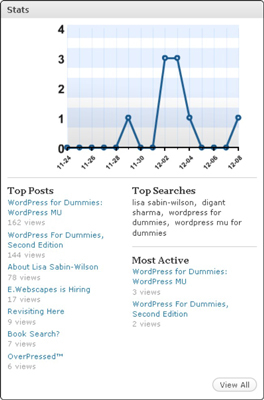 It includes a visual graph of your blog stats for the past several days. These stats represent how many visitors your blog received each day. Top Posts: Lists the most popular posts in your blog, determined by the number of visits each post received. It also shows you exactly how many times each post has been viewed. Top Searches: Tells you the top keywords and search phrases people used to find your blog in search engines. Most Active: Tells you which posts in your blog are the most active, as determined by the number of comments left on each post.